Jennifer You all may laugh at fika, and scoff at me when I say that it's difficult to have to go to a coffee break twice a day. But the social pressure to go really is rather intense: I thought I'd skip it last Monday, but V. and E. ambled by my door and asked if I was coming for coffee. I said "Sure, in just a minute," by which I meant "No." But they took it at face value, and when it became clear that they were not going to leave until I did, I gave up and headed downstairs. Good thing I did. There was a single candle burning in a tray holding a total of four candles. I asked why only one candle was lit. The Swedes pounced on this. "It's Advent!" they cried. N. explained. "It's first Advent, the first week of the four weeks before Christmas, so of course only one candle is lit. You are supposed to light only one candle per week until the Jul, and then that week all four will be lit." I thought about this for a second, and decided to go the dumb foreigner route, because sometimes it's fun to play into expectations. "But I want to light them all now," I said. They laughed. "Typical American!" said N. "You are supposed to wait. One of the Chinese students tried to light the rest of them, but we stopped him just in time." At Friday morning fika, I came into the break room... to find that two candles were lit! I gasped and pointed. "Aha! What's going on here?" I cried. "What happened to delaying pleasure and all that?" "Oh, well, you see, it's the Friday before Second Advent." My outrage amused them greatly. 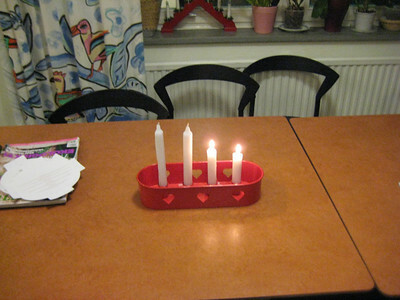 The group agreed, after some discussion, that the unwritten rules of Advent candles at fika amounted to this: you can light the next Advent candle on the Friday before the next Advent Sunday at your first fika. You cannot, however light the next Advent candle if you work at night, and your first fika on Friday is actually your second fika of your work day. So the ambulance drivers who work from 8pm Thursday to 4am Friday can not light the candles at their second fika at 1am on Friday, but the drivers who come in at 1am to replace them, can light the candles. It was suggested that the EU could write an 8-page document specifying how and when Advent candles can be lit; the conversation turned to how socially-enforced pressures are much harder the break than written rules. We tried to push the social situation to an extreme. "What if the King came to the fika of some small-town newspaper, and wanted to light the Second Advent candle before it was time?" "They would probably let him do it, but there would be complete and total outrage." said P. "Yes, they would frown," said S.
N., who you may remember had been the most outspoken defender of the purity of the Advent candles, had not been present for any of this conversation, but he now wandered in to fill up his coffee mug. Good, an ally, I thought. I waved at him triumphantly. "Look, look, they've lit the second Advent candle before the Second Advent Sunday! What do you have to say to that?" He peered at the candles. "Oh, that's okay," he said calmly. "It's the first fika on the Friday before Second Advent."